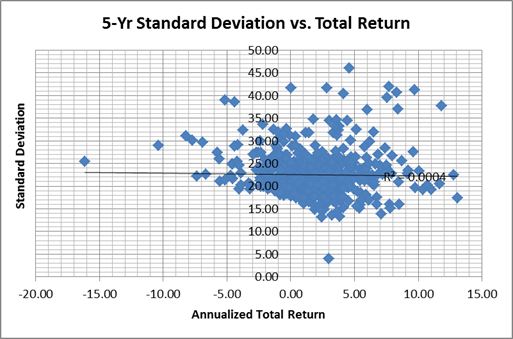 We looked at more than 630 US domestic no-load mutual funds with at least $100 million of assets over 3-years, 5-years and 10-years as of 08/31/2012 to see how volatility relates to total return, and how the spread between upside and downside capture ratios relate to total return. More volatility does not cause more return, but more spread between upside and downside capture ratios does. The dozen equity ETFs with the highest capture ratio spreads and the dozen with the lowest capture ratio spreads are provided at the end of the article. “More pain means more gain” is not borne out by these data. 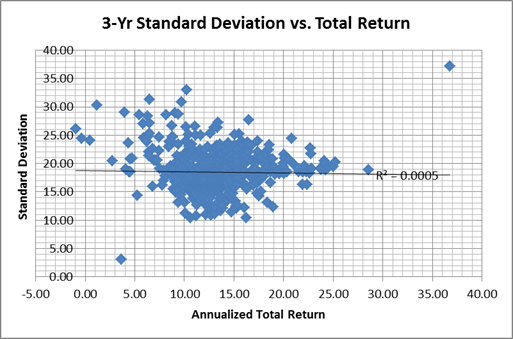 Linear regression does not show much correlation between volatility and return in the 3-year and 5-year historical time span, and only a little in the 10-year time span. There is no apparent need to accept extra volatility if lower volatility options are available. There may be other arguments for volatility, but they don’t show in this particular data. The “no pain, no gain” argument doesn’t seem to hold up well in light of this data. Volatility may create trading opportunities for the nimble, but portfolios that produce higher volatility do not produce correspondingly higher total returns. The “r-squared” value on the regression trend line indicates the fraction of the variance from the regression line explained by the relationship between the X and Y axis data. A zero value means no relationship, and a 1.00 value means a perfect relationship. No trend, r-squared near zero. Some trend, r-squared low at about 0.27. In contrast to volatility as an argument for higher returns which requires some faith or imagination, capture ratio spreads appeal immediately on a logical basis. 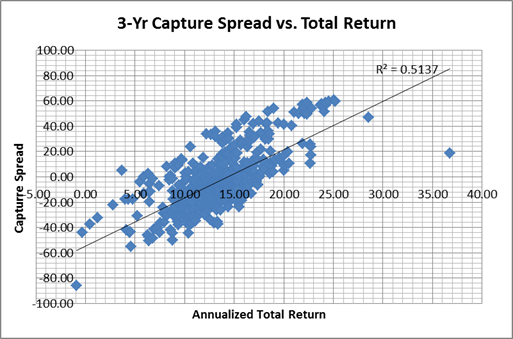 Capture ratio spreads measure how much more of the upward moves of a market are captured by the portfolio than the downward moves. If portfolio “A” goes up more in up markets and down less in down markets than portfolio “B”, then one would tend to assume that portfolio “A” is the superior choice. 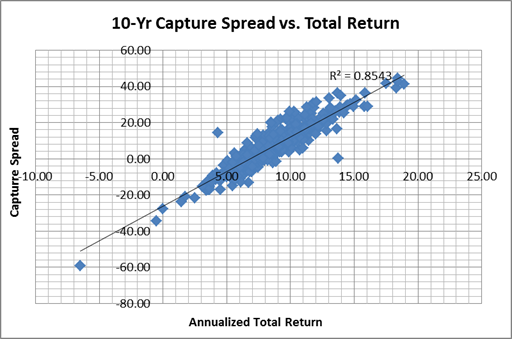 Note that a good capture ratio spread does not mean that total return will be positive, just that total return should be better than a portfolio with a less good capture ratio. That caveat is because if the number and depth of down market moves overwhelms the up market moves, the overall result for a long portfolio would likely be down. Capture ratios measure a fund’s performance in up and down markets relative to the benchmark market index (in the case of US stocks typically the S&P 500). 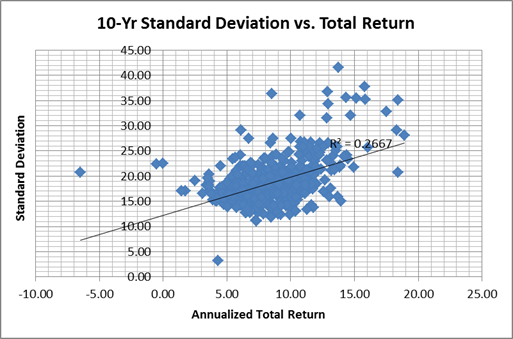 The ratio in this article is calculated by determining each month the size and direction of the price change for the S&P 500; then determining the size and direction of the price change for the same period for the fund being evaluated; and then dividing the size and direction of the subject fund by the size and direction of the benchmark index. Higher ratios are better for the upside ratio, and lower ratios are better for the downside ratio The idea is to participate maximally in upside moves and minimally in downside moves. 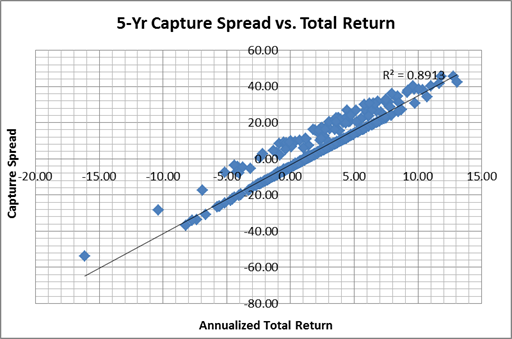 Favorable trend (more capture spread –> more total return), r-squared 0.51. Disclosure: QVM owns IBB in some portfolios. This entry was posted on Sunday, September 30th, 2012 at 10:32 AM and is filed under Analysis, Data. You can follow any responses to this entry through the RSS 2.0 feed. Both comments and pings are currently closed.